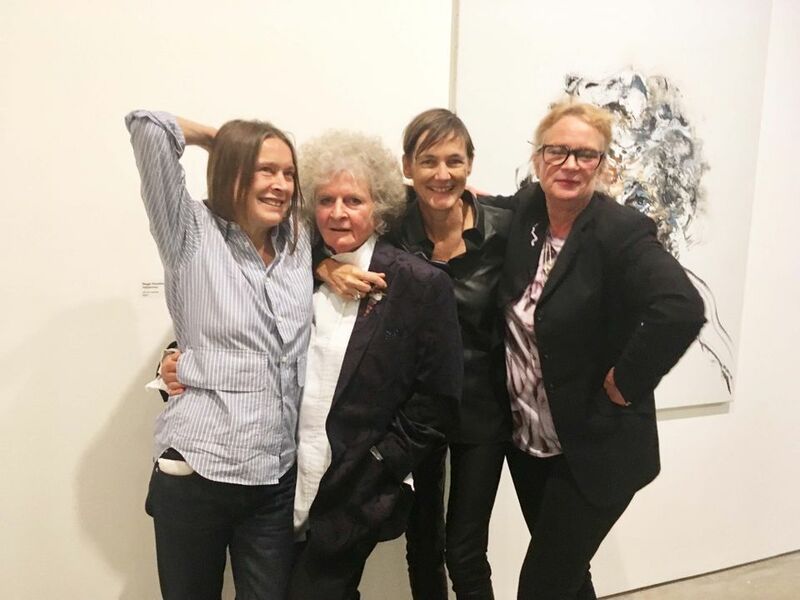 Artists Maggi Hambling and Sarah Lucas met in 2005 in the now sadly defunct bohemian Soho watering hole the Colony Room. Here, they discovered that their birthdays fell on the same day—albeit a few years apart—and they have remained firm friends ever since. This friendship now forms the starting point for an exceptional exhibition currently at the Jerwood Gallery in Hastings (The Quick and the Dead, until 6 January), which pays tribute to the web of relationships that, more than a decade later, has grown up around the duo, but with their own mutual affection still firmly situated at its centre. The Quick and the Dead features Hambling’s painted portraits of Lucas, her partner Julian Simmons, and their friend and sometime Suffolk neighbour Juergen Teller, as well as the late artist and dandy Sebastian Horsley, who was the instigator of that first Soho meeting. All of the above have also made reciprocal portraits of Hambling, with the exception of Horsley, who died from a drug overdose in 2010. These portrayals could not be more stylistically various. 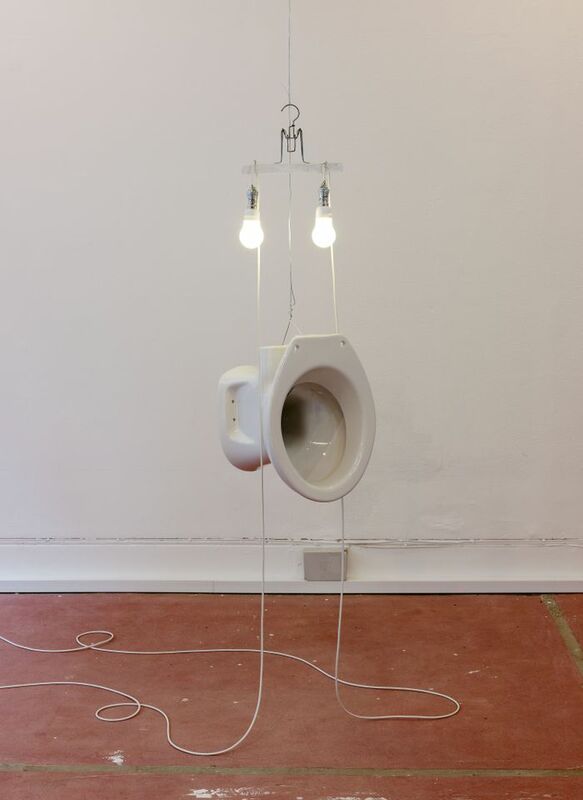 Lucas’s portrait-sculpture Magi consists of an upended lavatory bowl topped by a pair of lightbulbs suspended from a skirt hanger, whereas Hambling portrays Lucas as a painting on a wall presiding over a pile of her sculptural materials, all topped by a giant phallus. Teller has made a giant photograph of Hambling, taken while she was in the process of making her reciprocal three drawings of him, thus offering a rare view of this usually ferociously private artist at work. 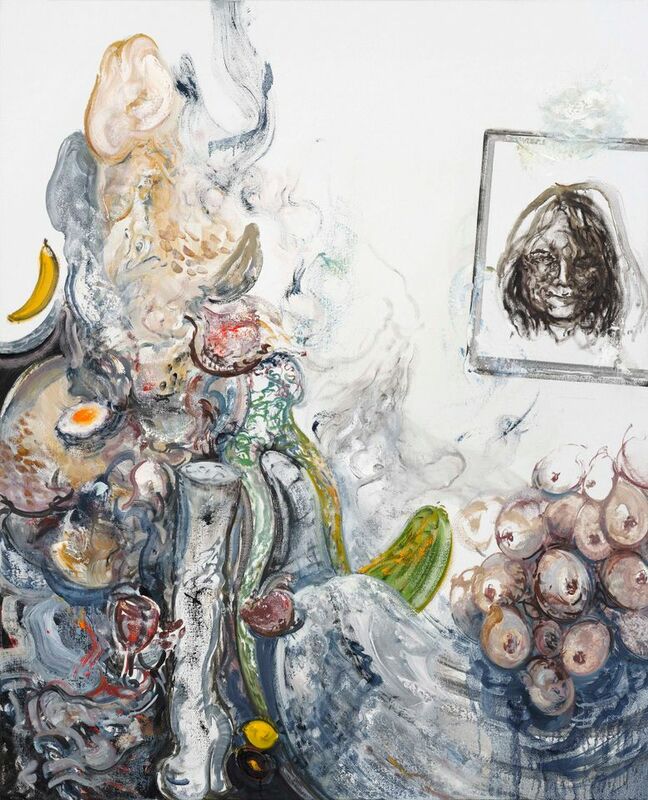 The puckish Simmons appears in Hambling’s painting bare chested, backed by flickering brushstrokes and paired with a painting of a swirling whirlpool, while he distills her image to a single staring eyeball, surrounded by a target of concentric graphite rings. But despite—or maybe because of—their very different means of expression, the show fizzes with vivacious visual conversations and surprising—and often touching—correspondences. Hambling’s famously beady eye (builders working on her house christened her Hawk Eye Hambling for her ability to spot any sloppiness) is literally and figuratively omnipresent throughout. One single blue eye pierces through the maelstrom of paint in a recent self-portrait, she peers with laser-like concentration around the edge of a drawing board in Teller’s photograph and then there is the solitary piercing blue orb that forms the highly disconcerting epicentre of Simmons’s elegant shimmering circles. Spirited interaction was also very much the order of the evening at the private view on 19 October, with key duo Lucas and Hambling engaging in a vigorous exchange during the opening speeches. Here, they ironed out a few misconceptions around Lucas’s portrait-sculpture of Hambling, with Lucas firmly declaring that, contrary to popular interpretation, she did not view her friend literally as a toilet bowl but as an esteemed magi in the biblical sense, personified by “a piece of illuminated sanitary ware”. At which the famously modest Hambling quickly interjected “Or more like a u-bend!” Either way, whether in their art or their persons, the enduring bond between these two kindred spirits and the community they have gathered around them is truly cheering to behold.